The Perils of (public) Beta Testing….. I have always been an early adopter. As far as I can remember, I have always been at the forefront of tech stuff. Quartz watches – check, Compact Disc – Check, MiniDisc – Check, DAT decks – Check, Home computers – check, Android – check, iOS – check, early releases – check, tubeless mountain bike tyres – check, pretty much everything – check. Friends and colleagues nearly always ask my opinion on things, simply because they know that I will have got it first and they want to know what something is like. Quite often, it has bitten me, but this does not seem to stop me. In Android land, there are big problems with being an early adopter, generally releases are announced many weeks before they are publicly available, even then you pretty much need to have a Nexus device to get in on the new release action in a vaguely timely fashion. The only other way is to run an ‘unofficial’ ROM. This tends to bring all sorts of other issues, like things just plain not working and all sorts of unintended crashes. Apple however are way more prompt with their releases, usually the release is available to anyone that has a device capable of running it within two weeks of the announcement each year. This is awesome if, like me, you cannot resist the shiny new release with all of the new and cool features. Obviously history has told us that the new releases inevitably have issues and inevitably these issues are patched fairly quickly. The beauty of the Apple update system is that as soon as the patches are released, they are available to everyone. Yay, more shiny things for everyone. Recently Apple has taken to allowing end users to download the latest, greatest OS’s in advance of the final version releases. Before iOS 9 was released to the general public, they opened up the beta program to the general public. Obviously I signed up. There were several releases prior to the release to the general public. Each release seemed to be pretty stable, but one or two small bugs reared they heads and in general the experience of being able to run this Beta, pre-release software was very good. When the final release landed the update from the final Beta version was tiny, perhaps little more than a version update. Because I was a part of the Beta program for iOS9, I got 9.1 very early. Again, this went through a couple of iterations and then the final consumer release was a small, incremental update. Again, I then got the 9.2 Beta invite, so again, I installed it, the first update seemed fairly benign, but the 9.2 Public Beta 2 has utterly destroyed the battery life of both my phone and my watch. I went from using perhaps 35% of each battery during a busy day, to suddenly running out of juice on both before 8PM. I had a conversation with Apple. They were not aware of any battery impacts in 9.2PB2, in fact they told me that battery life should be better. While we agreed to disagree, I was left with a problem. While it is possible to restore iOS9.1 on top of iOS9.2PB2, there are many reports of this leading to even more problems and even worse battery life. Apple told me that if I did reinstall 9.1 that they could not guarantee that everything would be OK. Faced with terrible battery life and potentially needing to start again, I felt that I was running out of choices. I decided to see if there was any way that I could load a 9.2PB2 backup onto a 9.1 device. The simple answer is that you cannot do this. At least you cannot do this via any official Apple tool. Starting from scratch was an option, but frankly it was an option that I did not like the idea of. Starting from scratch would lose about a year of health data, which is pretty much the only data that I do not have backed up in an easily accessible form and ironically, the only data that I really, really want to retain. So I started to look into the idea of backing up, just the health data, then carefully restoring it to a newly factory refreshed iPhone. A quick google gave me a few options. The first, option involved me exporting the health data from my phone and importing it into a new, blank phone. It seemed like a good idea, but with a couple of caveats, the maximum granularity of the data seemed that would not causes errors turned out to be daily. If I tried to import a years worth of step data, for example, it simply crashed. The limitations seemed unacceptable. So I restored the 9.2PB2 data to my phone and carried on hunting. I came across a company called ‘Decipher Tools‘ who are based in the US. 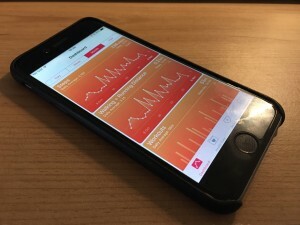 They have a variety of tools that help you recover from broken backups or extracting information, but what caught my eye was a blog post ‘Wipe your iOS Device, But Keep Your Health and Activity Data‘, this seemed to be very close to what I was looking for, but with a slight problem. I was running 9.2 PB2 and I really needed to drop back to the officially supported 9.1. I commented on the blog post, because, well, I really thought it was an awesome idea. This quickly lead to an exchange of ideas and this morning they rather nicely sent me a version of their program that pushed the version back to 9.1 in a backup. The only proviso was that I would test this out and report back. So, I tested it. I backed up my 9.2PB2 device and then ran the backup fixer program. It took a while, but The backup file that it produced seemed to be compatible with a 9.1 device. So, just because, I restored it. The actual restore was fast, and I was able to verify that everything looked good. I went through every app I could find and there is, as far as I can see, almost everything is there. Pretty much everything that you would expect to work, actually did, call history, fitness data, even saved game data, text messages etc it is all there. Apple Pay needed to be reset – again I think that this is normal. Setting up my Apple Watch failed the first time, but was fine when I re-started the process. Apple wallet remembered my Costa (coffee shop) loyalty card details, but the Costa App forgot me – which made no sense to me. In general some apps forgot me, some remembered me, but I could not find any missing data. Having proven that it would all work, it was time to do it for real. I unpaired / re-paired my watch and did another backup. Again, I used the tool to modify the version and also to clean out the junk in the backup files. Once this was done, I restored my phone to iOS9.1 and then with fingers, legs, toes and eyes crossed, I restored the backup to my newly blank phone. Apple make this type of thing dirt easy, only an idiot would get in a mess. Obviously I got in a mess. During all of this I had decided to backup my iPad, because, well, backups. I thought about restoring a backup onto it and I disabled iCloud’s ‘Find my Phone’. Then I though better of it and decided not to. Well the restore to the phone went great, it took about ten minutes. Then I had to sign into iCloud. Which has two-factor authentication. Obviously it wanted to send a code to my iPad or a txt to my phone. As my phone was mid set-up, I opted for the iPad. No code arrived. I tried again, several times. No code. Eventually I had to use the recovery code, which I had thankfully written down. Because, get this, iCloud ‘Find my phone’ was turned off on the iPad. Yes, boys and girls, Apple use the ‘Find my phone’ mechanism to send out security codes. I’m not sure that this is good or bad, but it definitely seems odd to me. Having got past that hurdle, I was able to get my phone setup with iCloud, then soon after, pair it with my watch. So far everything looks good, I am happy that I do not appear to have lost anything, but also my phone feels snappier and there is certainly a lot more space on it than prior to all of this craziness. I am hopeful that this has solved the battery life issues too, my first indications are that it has probably helped. Despite all this, my iPad is now running iOS 9.2PB2. I will never, ever, learn…..